Welcome to Manor Press Limited's design and print area of this website, here you can read about our history & experience in the printing industry, find useful information out about the different services we offer, how to supply artwork, common printing terms and view examples of our work. As I'm sure you have noticed Manor Press Ltd. is divided up into two key areas, half of our business is dedicated to supplying and in many cases producing bingo, raffle and fundraising items for use by clubs, pubs, charities, schools, etc. throughout the UK. 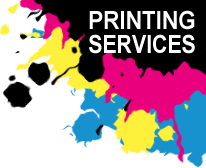 Where as the other half of our business is dedicated to producing and supplying quality design and print to the local community. We have chosen to only offer these services to the local area of South Yorkshire because we believe that you need to talk, ask questions and bounce ideas around so we can fully understand what you require and offer alternative options that you may not have thought about or even thought possible. Please browse our site and if you have any questions or require a quote give us a call on 0114 2695755 or email you can also call into our workshop for a talk and to look at some of the work we have produced. Here at Manor Press Limited in Sheffield we have our own in-house graphic design service. We can offer you a full design service, turning your scribbled down notes in to a professional, eye catching product and if you are just starting up we can create you a logo too. All of our designs are created with you and your final budget in mind, the price we quote is the price you pay. We don’t have any additional charges for looking at your disc’s or providing you with standard proofs. Our design department is open to everyone, we are happy to help design newspaper and magazine adverts or just create you a company logo. We are happy to supply both short runs & large orders, in either single colour, two colour or full colour (CMYK). Your order can be printed with or without numbers and/or perforations and can be supplied flat, creased or folded. Please feel free to contact us with your requirements to see if how we can help. We also have the capablity ot producing wide format prints including posters for A-boards & windows, safety signs, shop signs, magnetic van signs, builders plans, hemmed and eyeleted banners, self-adhisive vinyl labels and decorative canvas prints. You can order some our best selling promotional items directly from this site by visiting the Promotional Items page or for our full range of promotional items please click here.